Some of these skills are what my mum might have called “common sense” and others are akin to a martial art in that each movement is practised to perfection in order to ready the individual for battle. 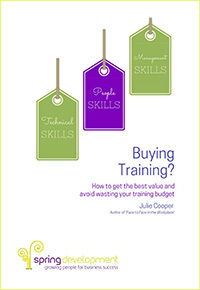 Julie Cooper’s book is aimed primarily at those who are in charge of others and, although probably geared to the less experienced or less highly-trained manager or supervisor, it has something in it for everyone. There is good, solid theory gleaned from reputable sources and suggestions for further reading, alongside simply stated, practically-focused advice. Principled negotiation, Raven and French power bases, The Big Five, Honey and Mumford, Robert Cialdini – they’re all there and beautifully summarised. ‘Section 2 – The Basics’ is a self-contained workshop in itself. Many of the managers and supervisors that I work with would find the information very valuable in bolstering their confidence and competence, particularly when new to the role. As one said to me recently: “I didn’t realise they would just sit there and look at me…what do I have to do then?” The answer is probably to read the ‘Three Step Tango’ or any of the other topics covered in this section. There were also both familiar friends and some thought-provoking new ideas that taught me something. We all know SMART, but what about SMART BMW? Or The Dark Triad? The rest of the book explores more specific situations and provides real-world examples of how to tackle them. 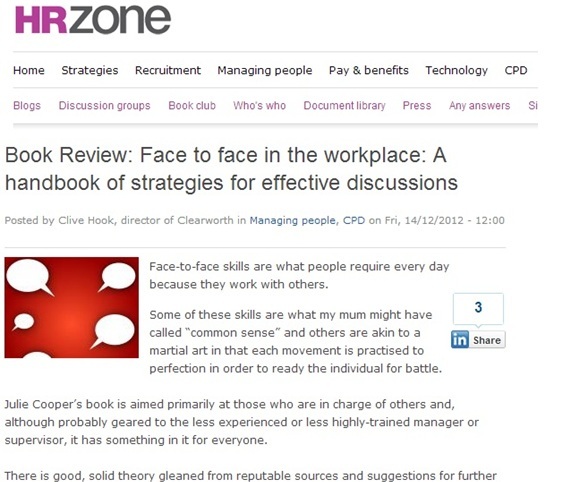 Topics covered include coaching, interviewing, appraisals, delegating, managing conflict and disciplinary meetings, all of which can result in many an inexperienced (and very experienced) manager going slightly weak at the knees at the thought of them. TOPI – The Other Person Involved. Cooper neatly avoids ‘s/he’ clumsiness by referring to ‘he’ in some chapters and ‘she’ in others – and she announces that she will do this too. Each chapter likewise offers examples of good practice and, where appropriate, a warning if there are common traps or legal issues to be considered. Reviewing this book was a joy because chapter 1 is entitled ‘How to Use the Book’ and explains what it is and what it isn’t. For instance, it is not designed to be read in one sitting (and it tells you that), although the ‘Basics’ section acts as a great foundation. Instead the work is intended to be referred to when you would like a quick refresher or when the need arises. And it covers its subject matter in an original, down-to-earth way that (my mum would like this bit) makes just about everything seem like common sense. The only downside is that the book is not pocket-sized, which would be a nice idea. But I don’t mean that in terms of its thickness (about 250 pages). Instead I’m referring to its surface area, which is about twice the size of a normal paperback.